Amazon India selling TecMac New Folding Mini Wireless Mouse 2.4GHz Arc Optical with USB Receiver Suitable for Laptop, PC Computer, Desktop, Notebook (Grey) Rs 399 only which is worth for Rs 1299 best and lowest price online.Free Shipping & Fast for Prime Users. Activate You can follow the below steps to buy this product at their deal price.Keep Visiting dealsheaven.in for more Best offers ,hot online deals, promo code, coupons and discount . Lightweight with Travel Mouse: Lightweight, Surface Arc Mouse goes anywhere without the weight or bulk of traditional mice. It can easily fit in your bag for travel. The Surface Arc Mouse connects wirelessly to your Surface device via Bluetooth. 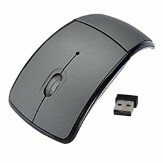 Wireless Optical: Compact wireless optical mouse with long rang wireless distance with 2.4GHz. Wireless mouse working 16channel, Frequency-Hopping spread spectrum. Plug-and-Play Wireless: Flexible and convenient, just connect the computer USB interface can be attached to the bottom of the mouse wireless. How to buy TecMac New Folding Mini Wireless Mouse 2.4GHz Arc Optical with USB Receiver ?